If you have diabetes, your body does not metabolize carbohydrates properly, and you have high blood sugar levels. A carbohydrate-controlled diet can help you manage your blood sugar levels, and healthy, high-protein snacks can help you stick to such a meal plan. The American Diabetes Association suggests including a source of protein at each meal. An 8-ounce container of fat-free plain yogurt contains 13 grams of protein, or 26 percent of the daily value for an individual on a 2,000-calorie diet. Consuming more low-fat dairy products, such as yogurt, may help you manage your diabetes. Yogurt is a good source of calcium, which helps build and maintain strong bones. For a high-protein, low-carbohydrate snack, have plain, fat-free yogurt with cut vegetables, such as broccoli and cauliflower florets or snow peas. 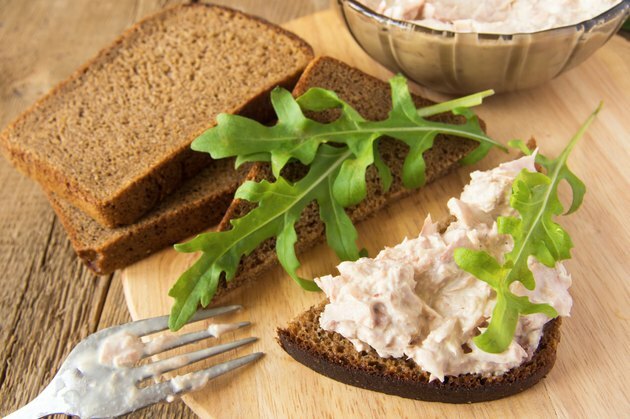 A 3-ounce serving of canned light tuna in water provides 16.5 grams of protein. Canned tuna and tuna in a pouch are ready-to-eat foods that you can store without refrigeration at home or work. Tuna provides omega-3 fatty acids, which can lower your risk for heart disease when you consume them regularly. This benefit is important for diabetics because diabetes is a risk factor for heart disease. Have tuna on a slice of whole-wheat bread with lettuce and tomatoes. Sliced turkey breast contains 4.7 grams of protein per ounce and only 28 calories. Take a few slices of turkey and spread them with part-skim ricotta cheese, which provides 14 grams of protein per 1/2-cup serving. Place avocado slices, which provide heart-healthy monounsaturated fats, on the cheese. Roll up each turkey breast slice around the cheese and avocado for your snack. Vary the snack by using fat-free cottage cheese or slices of low-fat Swiss cheese instead of ricotta. A 4-ounce serving of nonfat cottage cheese provides 12 grams of protein, and it is a source of calcium. Consume your cottage cheese with 2 tablespoons of sunflower seeds or an ounce of nuts, which add healthy unsaturated fats. Cottage cheese also goes well with celery sticks, cucumber slices, berries and melon. Choose reduced-fat cottage cheese instead of regular to reduce your consumption of saturated fat, which raises cholesterol and further increases your risk for heart disease. One-half cup of fat-free refried beans contains 6 grams of protein, and an ounce of nonfat cheddar cheese has 9 grams. Melt shredded reduced-fat cheese onto fat-free refried, black, pinto or other beans, and top it with salsa or fat-free yogurt if you want. You can eat your beans and cheese on their own, or you can use a lettuce leaf to wrap the dish. Choose low-sodium canned beans or cook dried beans to reduce the sodium content of this high-protein snack.